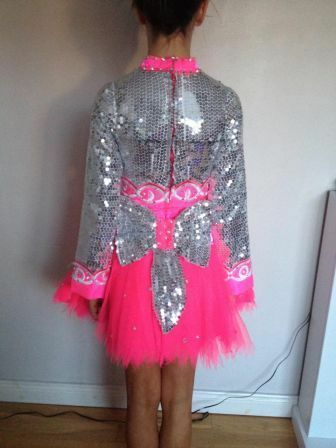 Stunning bright pink/silver dress with crystals/diamonds which really sparkle on the stage. Skirt all over tutu net and less than 1 year old. Kept in non smoking house. Note – all measurements are approximate and have been taken with dress lying flat. Bodice and Full length have been taken from top of shoulder with the bodice to the lowest point at the front. Skirt lenght is the shortest length front top of point to bottom. If interested will take any further measurements required.